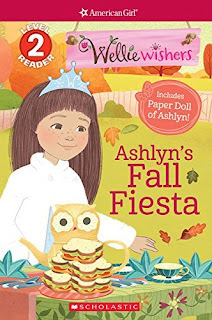 Ashlyn's fall fiesta is going perfectly. . .until the wind comes and ruins everything! Can the other WellieWishers help Ashlyn have fun at the party, even when things don't go as planned? This Level 2 beginning reader is based on the bestselling American Girl WellieWishers characters and the charming animated series. For any fan of the Wellie Wishers this is a great book for younger readers. It is a shorter book but perfect for kids in 2nd-3rd grades, depending on their reading ability. The plot of the book was fun and the book was a quick read but it is a book that you really get drawn into because of the characters. I loved how the story brings in the other Wellie Wishers into the story itself! If you are an American Girl or Wellie Wisher fan you will love this book!